If you were to put a gun to my head and ask me to name who my favourite music video director was (admittedly you prob could just ask over a beer or two), I’m 99% certain the first name out of my mouth would be Carlos Lopez Estrada. Featuring inventive concepts, brought to life through equally creative production, Estrada’s consistently excellent output never fails to amaze and entertain. He makes videos you love to watch and videos you always want to know more about – and on that note, we spoke to the eclectic director about his latest music promo for Kari Faux track Fantasy. We’ve been following your work for sometime on Directors Notes and the thing that always impresses us about your videos are the constantly inventive concepts you come-up with, the Kari Faux video being no exception. How would you sum-up the premise of this video and where did the idea for it come from? Well, thank you. I have been following your website for some time now so we can safely say that the love is mutual. I’d lazily sum it up by saying that it’s a video about heartbreak. I think people tend to lose their ground when experiencing extreme emotional circumstances and this video tries to capture someone battling with depression. We start as a passive observer of someone’s habitat, but as time passes and the video progresses, we see things through Kari’s point of view, which amplifies and exaggerates the reality around her. The idea was inspired by the music, honestly. I was having trouble coming up with something and decided to break the song down to its very basics: It’s a song about heartbreak, it has a very memorable bass line (the song was even more stripped down when I first heard it but they have since added a bunch of jazz instrumentation. It was only bass and drums when I first listened to it.) and the overall production of the track is overly simplistic. Those were the tools I gave myself when coming up with an idea and ultimately what became the backbone of the video. There also had to be some fantasy in there somewhere because, you know, it’s the title of the song. There also had to be some fantasy in there somewhere because, you know, it’s the title of the song. To make an inventive premise work, you need some inventive production to really bring it to life. This video looks as if it took set-building, puppet creation and a whole lot more to achieve its distinct look, can you give us an insight into the locations, equipment and approach used on the shoot? I was able to work with many close friends on this, which was a treat. Tyler Jensen – who I work with often- did the production design. Him and Nelson De Castro constructed the miniature of the building together. 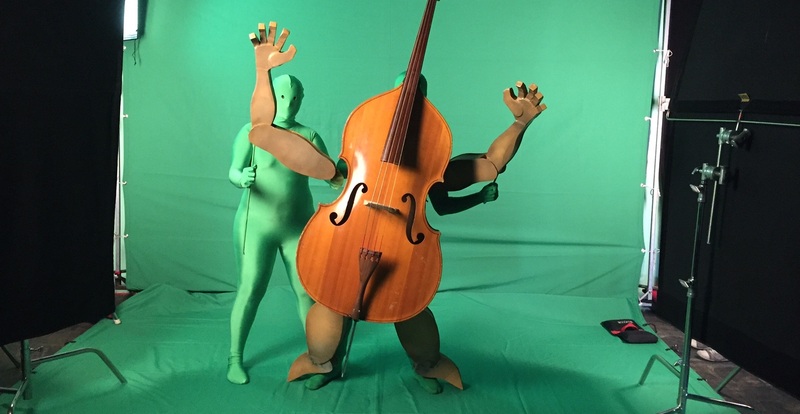 Cristina Bercovitz – who I had directed a theatre show with a year ago – designed, built and puppeteered the bass monster. A studio in Brazil called Nash handled all the post. I had just finished a Corona commercial with them and sneaked this video into their schedule before they jumped on to their next big commercial job. It was a labor of love for all of us, which usually ends up being the most fun kind of projects to work on. The “spinning” camera used in this video and the clever use of set reminded me of another project you filmed recently, #BARS – how did that project come about and can we expect to see more of it in the future? I actually shot both videos the same week and was concerned that I was repeating the same idea twice. I thought no one would catch it, but you did! Oh, well. #BARS is a rap workshop for musical theatre actors in New York City. It was created by Rafael Casal and Daveed Diggs who are incredibly gifted poet/actor/rappers. Each session is 5 weeks long and accommodates about 15 students. Each of them writes and performs their own piece at the end of the session, and we film it all together in a one-shot medley. The workshop actually got a lot of attention and it is now being hosted at the Public Theater in NYC. We are filming the next medley in a few weeks and I could not be more excited. These guys and girls are so ridiculously talented, it’s absurd. I had a really fun summer and got a chance to work on a few projects that I am very excited about. There are 2 Clipping videos coming out as well as 3 that we just shot in Mexico City for another rapper called Watsky, who is great. I also shot a very small video for a new R&B artist called Elena Pinderhughes. She is a virtuoso Jazz flutist who is releasing her first solo album later this year and her music is really good. I may be doing some narrative work in LA too. A series I am not allowed to talk much about, but I really like. What a cliff-hanger! To see more of a Carlos’ work (and there are quite a lot of videos to view), check out his Vimeo feed or Website and hopefully we’ll get him back on DN when he releases his next project…which knowing his prolific output, could be tomorrow!